If you own a Windows PC, an Xbox 360, or an Xbox One, and you haven't at least heard of World of Tanks, then you've probably been living under a rock. You've also been missing out on one of the best free-to-play (that's what the developer calls it, though more accurately it is a "freemium" game with microstransactions) games to be released in the past five years. World of Tanks, as the name implies, focuses exclusively on tank vs. tank combat. Tank warfare is hardly unique—it has been a part of the Battlefield series since its inception in 2002, and it has been a small but notable feature in the multiplayer of a few select Call of Duty games—but no other game has gone to the depth that Tanks has done. Each tank (and there are a lot of them: 241, to be exact) has its own tech tree that features upgrades to the main cannon, engine, armour, and treads: while it is necessary to research the 'main tech tree' to unlock the next tank, there are also other smaller branches that grant tanks unique features like ultra powerful, but slow to load and limited in range, main cannons. Each tank is assigned its own crew, too, all of whom rank up as you take them through the fires of war. 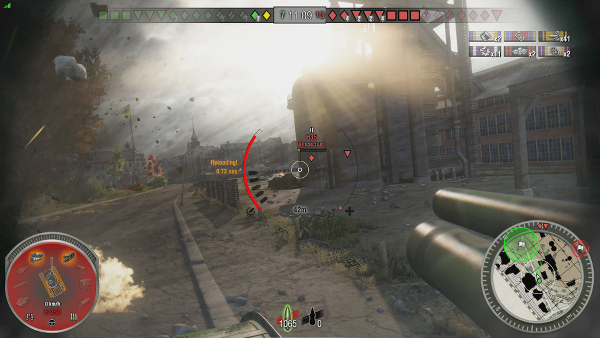 As you spend more time in one tank, that crew gets better at their jobs: the gunner will be able to load faster and the spotter will be able to find targets from further away, for example. But if an enemy scores a critical hit on your tank, components of your tank (e.g. the cannon or treads) can be damaged and your crew can be injured, reducing your tank's efficiency through the end of the match. So once you've chosen a country, a tank, and a crew, now what? Well, you can load up consumables to help you in your quest (repair kits and first aid packs) or jump straight into battle. As some of the lightly armored vehicles can be easily destroyed in one or two hits, or you can be really unlucky and get picked off in the first minute of the game by a tank destroyer on the other side of the map, I usually don't bother spending my silver (the 'free' currency you earn in-game) on consumables. 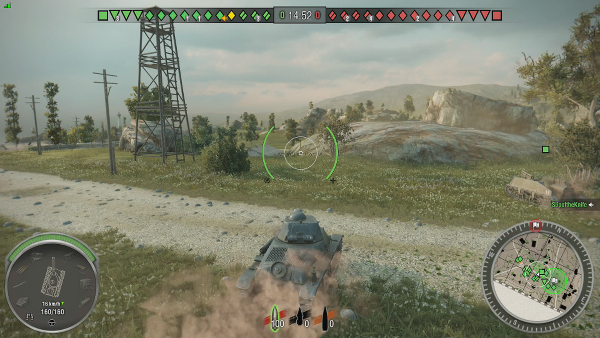 So how does World of Tanks actually play on Xbox One? (Thank you for asking.) The first thing I noticed is that it is definitely smoother than the Xbox 360 version: the graphics are not necessarily miles better than on its predecessor console, but they are certainly more detailed. The biggest difference, and what yields the biggest improvement on Xbox One versus Xbox 360, is the lighting. On the 360, Tanks looks kind of like an older Battlefield game—the lighting is not detailed, and every daytime map looks a little washed out against a cartoonish blue sky. 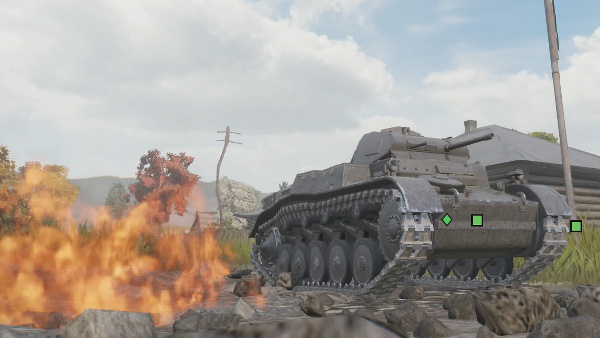 On the Xbox One, World of Tanks' lighting is layered, it's subtle, and produces more detailed and more realistic shadows. While that may not seem that important when you're only playing the Xbox One version, the difference is astounding if you've played on the 360 or if you see a side-by-side comparison. The tanks in the game have been well detailed and modeled. I've done some checking around on the internet, and Wargaming has done a great job bringing true data into the game: armor thickness, weapons platforms, speed and horsepower are all faithful to their real world counterparts. Some of the upgrade trees allow the player to utilize prototype upgrades, scrapped tanks, or limited production models, so I can't necessarily speak to the realism of those. But, this faithfulness also leads to some balance problems due to the choose-your-own-tank structure of the game: M4 Sherman tanks, for example, are poorly armored; British tanks generally have thick armor but their weapons have a difficult time penetrating enemy tanks' stronger front and side armor; German tanks are well-rounded power houses. Because teams are random and your teammates can bring any tank they want into the game, you sometimes end up with teams of offensively powerful (but defensively very weak) tanks going up against powerful tank destroyers and artillery coupled with the Germans' obscenely fast Panzer III light tank working as spotters. Sometimes, you'll be participating in a game that runs nearly the full 15 minutes... other times, your teammates will be completely crushed in the opening minutes of the match. Because your tank can participate in a tier up to two levels below its maximum, who your team is (and who you're playing against) i all the luck of the draw, and it can feel a little cheap when you go up against a team of tanks that are mostly one or two tiers above you and your teammates, and you have absolutely no way of altering the outcome. When that happens, it can be incredibly frustrating. One major plus in the game's favor is that I've never experienced a dropped or lost connection to the server; in total, I have experienced exactly six seconds of lag that occurred at the very start of a single match. I have never seen anyone time out or receive an unfair advantage due to network issues. 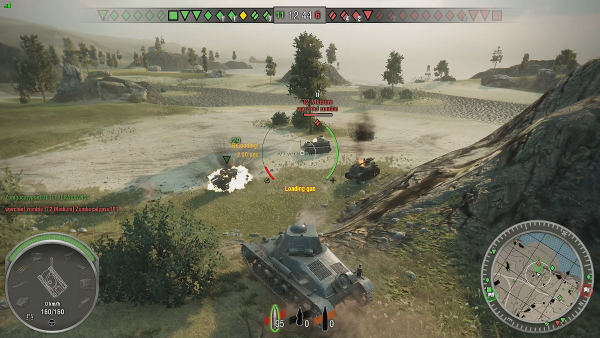 But despite the game's minor deficiencies, when you get a team that manages to work together either through—GASP!—communication or (more likely) by pure luck, World of Tanks can find moments of greatness. There's just something exhilarating about driving a tank, dodging the artillery shells pounding the ground around you, while light tanks scout hostiles, medium and heavy tanks duel it out in the middle of the map, tank destroyers picking off targets from afar, and you find yourself backed into a corner, surrounded and outnumbered, your tracks damaged, and your only allies being your tank's smoking cannon and high explosive rounds. If it capitalizes on its strengths and polishes its mechanics, then future episodes of Blues and Bullets could definitely be winners. Forza Horizon 2 has raised the bar for open-world racing games. The beautiful setting and sensational visuals are one thing, but when you mix it in with heart-pounding races, an extensive car list, intense competitive online play, and a vast explorable world, it all translates to Horizon 2 being the cream of the crop in the genre and the best in its class.